Anne of Green Gables: "With a sigh of rapture she relapsed into silence." 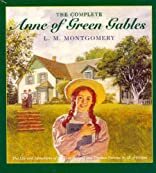 Anne of Green Gables Collection: 12 Books, Anne of Green Gables, Anne of Avonlea, Anne of the Island, Anne's House of Dreams, Rainbow Valley, Rilla of Ingleside, Chronicles of Avonlea, PLUS MORE! Here is a deluxe gift-box edition of L.M. Montgomery's classic stories about one of the most beloved fictional heroines of all time--Anne of Green Gables. 12/2/2008 Sara Joiner said: My favorite book! I was able to travel to Prince Edward Island in May, and I cannot describe how thrilled I was to see Green Gables and walk through the Haunted Wood and stroll down Lover's Lane. Truly, that was one of the greatest days of my life. 10/26/2007 Renee Hale said: A great book for girls if they enjoy historical books. My all time favorite growing up!